What effects do different environments have upon stress levels in the human body? What affect does it have upon our well-being and health? In order to test this in June 2014 WISERD’s biomapping project was invited by BBC Coast to ‘stress-test’ its presenter Nicholas Crane. 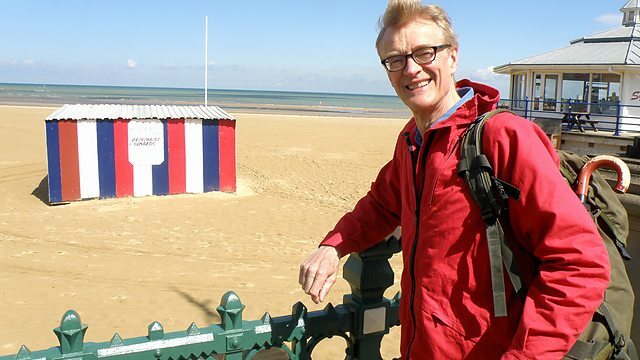 The WISERD funded biomapping research project, led by Professor Chris Taylor (WISERD) and Dr Jon Anderson (CPLAN), ‘stress-tested’ the BBC presenter Nicholas Crane for the forthcoming series of the television programme ‘Coast’. The research project uses ‘qsensor’ technology to quantify the effect of the built, natural, and social environment on the human body. Dr Jon Anderson met with the BBC team in London and carried out a series of ‘stress tests’ which sought to measuring the electro dermal activity (or nervous energy) of the skin, these included walking in the city, cycling a Boris-bike around Trafalgar Square, and negotiating the Underground system. These results were compared to an early evening walk along the sands at Southend on Sea. The experiment was broadcast on the first episode of the latest series of BBC Coast. Apart from making diverting TV, this research raises interesting questions that are central to the broader WISERD project: the importance of geography to the human condition, the creative tensions that are central to merging qualitative social science with quantitative scientific approaches, and how these knowledges can be communicated effectively to different publics. For me, the experiment raises as many questions as answers. Yes, it is possible to use biomapping technology to measure the ‘stress’ different environments have on individual humans. However, what particular components of the environment have most influence in peaking ‘stress’? How can these components be determined, and will they have the same influence for everyone? Once identified, can these components be designed out of environments in order to improve human well-being? Central to these questions is the theoretical project of how the notions of ‘environment’ or ‘place’ should be considered. For example, should we begin thinking about how particular components or flows constitute a particular geographical location, and how these components becomes more or less ‘salient’ to different people at different times. Such searching questions demonstrate the utility of WISERD’s diverse research programme, and how forays into popular TV can help progress its research agenda further. About the author: Dr Jon Anderson is a Reader in Human Geography at the School of Planning and Geography, Cardiff University. His academic interests are oriented around the ‘extraordinary sets of relations between people and places’ (Holloway & Hubbard, 2000:6). These ‘extraordinary relations’ circulate around a number of spaces of interest (Environmental Action and Identity; Geography, Place & Culture; Rural Political Action; Water Worlds and Surfing Places; Emerging Ontologies; Literary Geographies; Innovative methodologies and communication) and have led to a range of international quality research publications and funding projects. Image source: Nicholas Crane, BBC Website. The environment is our most important tresure and it has an important role in our life. The importance of geography to the human condition is a reality and keep our planet clean it’s a great first step to help our life. Pollution increases the stress degree. We can just think about the acustic pollution in the cities and we can understand how the geography and pollution can really impact on our life.